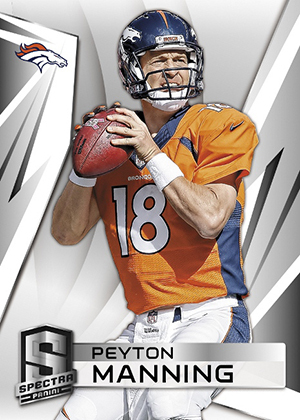 2014 Panini Spectra Football marks the sophomore tilt for the high-end, hits-heavy chromium brand. Of the 16 cards in each box, ten are either autographs or memorabilia cards. With parallels taking up two more slots, that leaves just four base cards in the average box. 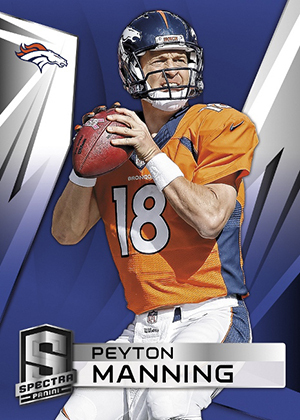 Everything in 2014 Panini Spectra Football is serial numbered to 199 or less. Seeing as how it's a chrome-style release, there's the customary colorful parallels. Base versions include Blue, Orange, Red Die-Cut and Black Die-Cut. 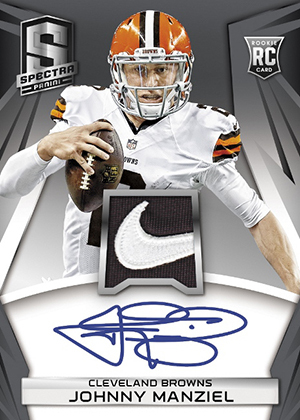 Rookie Jersey Autographs take a similar parallel-laden approach that include rarities with patches, tags and Nike Swooshes. The various patches and premium swatches match up with a color as well. 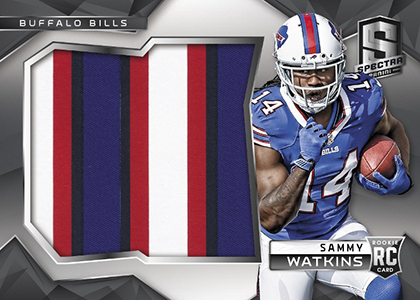 Rookie Jumbo Jersey cards have over-sized swatches while Combo Rookie Jerseys match up a pair of players. 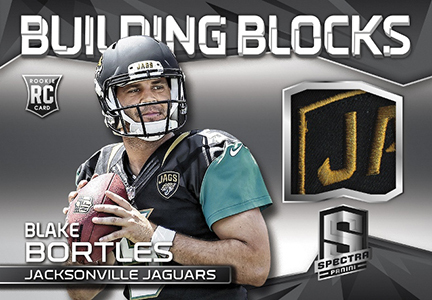 More player-worn jersey pieces from first-year players can be found in Building Blocks. 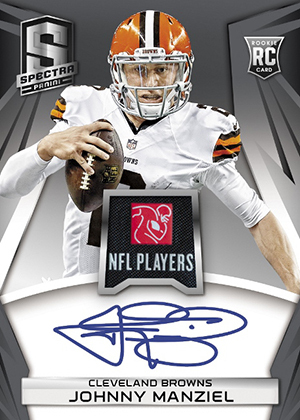 2014 Panini Spectra Football also has autographed memorabilia cards such as Leading Men Materials Signatures and Aspiring Signatures Materials. 200 cards. 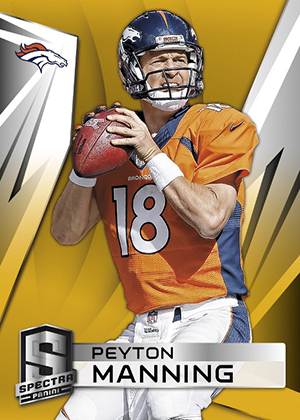 Veterans - #/75, Rookies - #/149. 17 cards. Serial numbered #/149. 65 cards. Serial numbered #/149. View the full Excel spreadsheet for specific print runs. Not all cards are found in each parallel. View the full Excel spreadsheet for specific print runs. 40 cards. Serial numbered #/199 or as noted. Can anyone actually afford this? Are you kidding me?? 16 cards in one pack for $275. Saw some opened and wouldn’t pay $120 for those. Lots of relics and sticker autos too. It was better when they had them in the mini boxes so you wouldn’t have to pay as much. They made the same mistake with Absolute this year. 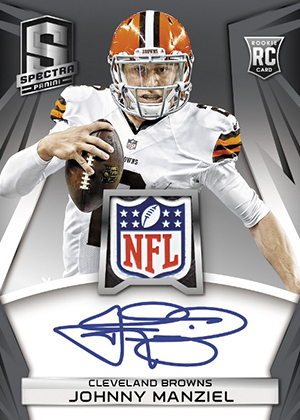 At this price sticker autos just doesn’t do it for me. when I made my comment, this website was showing boxes at $2,995.00. I ordered a box from Amazon and it was 160. 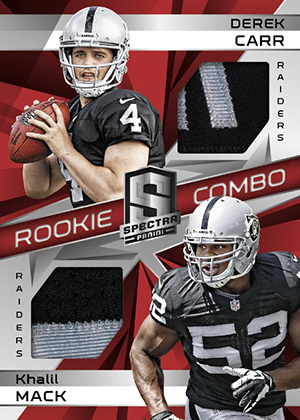 Much cheaper than this years Spectra. 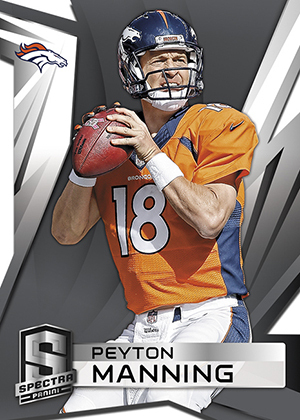 Compared to Triple Threads you get more cards and hits for a better value now that the price went down. I actually like the style better than this years. Too much going on with the new ones. Anyway, if you like patch cards, you’ll love this box.